No idea if anyone will read this ... all the bored regulars from a few years ago seem to have gone the way of the Oozlum bird. After the demise of the Marks & Spencer Deli Section in selected Sokos department stores earlier this year, I was wondering where I'd get my emergency teabags and biccies. "Valikoimat kasvavat noin 200 tuotteella. Hanke brittituotteiden tuomiseksi S-kauppojen hyllyille aloitettiin ennen kuin britit päättivät erota EU:sta." "TESCO ON MAAILMAN viidenneksi suurin vähittäiskaupan yritys. S-kauppoihin myyntiin tulevat tuotteet ovat muun muassa Tescon Finest- ja Free from -sarjoista. Finest on Tescon oma merkki, jonka tuotteet edustavat Alarodun mukaan sen ”parasta laatua”. S-kauppoihin tulevat tuotteet ovat muun muassa teetä, hilloja, ateriakastikkeita, mehuja, myslejä, keksejä ja pakasteita." In Pori S-market on Isolinnankatu I bagged lime curd, raspberry jam, shortbread fingers, cheese & bunion crisps. All were very reasonably priced & welcome additions. They had English breakfast tea, but I have a cupboard-full at the moment and S&V crisps - next time. There were a couple of jars of cook-in sauces, but I never buy them... didn't see the chutney, and some curry powders / spice mixes would also be a handy. The cheeses were less impressive, teeny tiny 150g blocks of Red Leicester and smoked cheddar. In the UK that would surely be a 250g block and half the price. At €23/kg they are taking the piss, when the other cheddar they sell is €18/kg and in Lidl cheddar (& red Leicester when available) is closer to €10/kg. Fresh orange juice was puzzling - when there are at least 10 other brands available and it must cost a bomb to transport something with such a low €/kg all the way across Europe. sinikala wrote: In the UK that would surely be a 250g block and half the price. At €23/kg they are taking the piss, when the other cheddar they sell is €18/kg and in Lidl cheddar (& red Leicester when available) is closer to €10/kg. What kind of an idjit would be willing to pay that price? Nobody it seems, the cheese section looked untouched today. Salt and vinegar crisps on the other hand were all gone and there was a single lonely looking bag of the steak flavoured crisps left. Flapjack cookies were similalrly wiped out. The shortbread is rather good. Quite a nice selection of gluten-free and milk-free products (gluten-free fish fingers, milk-free ice cream, gluten- & milk-free tikka masala sauce). But probably not things I would normally buy now that my allergy-ridden offspring has flown the nest. But good to see a better selection and not so expensive either. Then they've failed in their market analysis. Looking at the shoit most Finns buy (Rainbow et al), they would have been better off shipping in their Value range. Took the pecan and toffee roulade to some friends today, went down well. Damn that would make me happy. Not seen any yet though. Almost Kellogs crunchy nut. Never seen in Finland yet. I always buy a couple of packets from the UK. 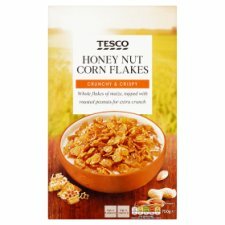 Can't understand why Kellog's CNCF aren't sold in Finland.. probably too many chemicals, damn you Brussels and your straight bananas etc. etc. Sent S-Market some feedback / a few suggestions of other things available in Tesco that S-Market might consider stocking.